[JULY 6, 2000] When we collectively sent off our own Brian Cook to the University of Illinois, visions of Final Four trips danced in our heads. Right now many of us would settle for one trip, much less four. But in order to understand where we are and where we’re going, it’s equally important to remember and mark where we’ve been. That’s exactly what 7,000-plus fans did at the Assembly Hall recently, with a reunion of our last Final Four team…the 1989 Flying Illini. Really, a lot of that season was just the journey. The players and coaches had worked so hard you felt that the team was just due. The momentum started early, perhaps in the great 18-point come-from-behind victory over Missouri in the annual "braggin’ rights" game at the arena in St. Louis, and continued to build. Then came our invitation to the Big Dance. We not only received a No. 1 seed…I contend that we were the No. 1 of all the No. 1s! To this day I think the bias of the NCAA against us was manifested by the cakewalk they gave Michigan and the hard road they gave us. It wasn’t the first time the NCAA persecuted the Illini and it probably won’t be the last. At any rate, we drew McNeese State and got to play them at the Hoosier (now the RCA) Dome in Indianapolis. Those Hoosiers just never seem to get tired of watching good basketball from Illinois teams, no matter who’s coaching us! McNeese was a much better No. 16 seed than some of the teams they march out there now. They had had some great quality victories that season and had a very good slow-down scheme versus the Illini. (On a personal side note…in the "it’s a small world category"…two guys that I later became friends with had just signed their letters of intent to attend McNeese shortly before the NCAA tournament.) Luckily, we got the jitters out in time to hang on to a hard-fought victory. Two days later, I found myself back in the dome worried to death. Our second round match-up was against THE BEST team you’ve never heard of; at least most casual fans had never heard of…The Ball State Cardinals. I’ve never been a casual fan…don’t want to be…won’t accept the position if it’s offered. A guy you may have heard of, Rick Majerus coached Ball State. Rick felt, and so did his team, that they could derail the Illini’s dream season. For a long time during that game, it looked as if they would. I’ve watched it on tape a couple of times, and I’m still not sure how we pulled off the victory, but we did. That won us a trip to the Humphrey Dome in Minneapolis. While everyone else was dancing deliriously in the streets, I grabbed my bracket page to see whom our next TWO games would be against…LOUISVILLE and SYRACUSE…thanks, NCAA; thank you very much! The match-ups against Louisville did not look like they would favor the Illini, but Marcus Liberty had a monster game, and the Fighting Illini were one step away from punching the big ticket. It was at that precise moment that disaster struck and almost prematurely ended our run. Kenny Battle slipped on the wet Dome floor that was leaking after a huge rain, and Illinois’ chances were leaking as well. Incredibly, the trainer and the medical staff patched him up, and that, coupled with his voracious will to win, unleashed themselves on the Orangemen on Easter Sunday afternoon. In a game that seemed like it took two weeks to play, the Illini hung on to a victory by the narrowest of margins. I know it’s crazy, but there have been few times in my life that I’ve been as happy as I was on that Easter Sunday afternoon. I was watching the game on Dr. Blaum’s old big-screen TV that was then stationed at Craig and Cathy Zastrow’s house over in the Mayfair subdivision. We had just gotten home from Easter services at Jefferson Street Christian Church and didn’t even take time to change. I was so happy that in retrospect I think I was actually delirious! I ran out into the street with my suit still on but in stocking feet, waving my orange and blue Illinois flag. I shouted to the neighbors and any passersby, "We’re going to the Final Four…we’re going to the FINAL FOUR"! Craig Zastrow and I probably should have been in Minneapolis to experience the bedlam firsthand for ourselves. But we felt it was more important to be with our families on Easter. Perhaps we were a part of the victory after all. In fact, Kendall Gill said it best when he was asked how he felt, and was there anything better than celebrating a trip to the Final Four. He said, "The only thing that’s better is celebrating the resurrection of our Lord"! At any rate, I sprinted back into the house and had a phone surgically implanted to my ear. If there were to be any hopes of Craig and me joining Battle in Seattle, we would have to strike quick and decisively. I got on the phone and called every travel agent I knew. I called the U of I to see what kind of trips and deals they were going to offer. One of the first calls went to another of my best friends, John Coady of Taylorville. I have gone to Illinois football and basketball games with John for many years and I knew that he wouldn’t be out in the cold on this one either. He was one step ahead of me already (I love it when great minds are thinking alike), as he had taken the liberty of procuring our Final Four tickets. John had even booked his flight, but it was too expensive for Craig and me, and the price seemed to be going up every minute. Then out of nowhere it hit me…Amtrak would be a lot less expensive…we could take the train to Seattle! I had no idea what I was saying, but five minutes later we were booked on a fairly inexpensive rail-air round trip to Seattle. It was the trip of a lifetime…other than the game. Actually the wound is so deep, I still can’t talk of the game at the Kingdome…but the trip was a total adventure. We rode Amtrak’s "Empire Builder" through Wisconsin, Minnesota, North Dakota, Montana, Idaho and on into Washington. A trip that took John Coady three hours by air took us two and a half days by train! But, oh, the sites we saw and the people we met! There were even two characters on the train from Panama, Ill., who claimed to be following the Illini out west as well. It was one of those spur-of-the-moment trips or vacations that makes you wish that you took more of them. The trip kept getting better and better. Current Springfield resident Gary Winkleman was living in Seattle at the time, and he offered to house Craig and me even though he didn’t know Craig from Adam. On top of that, he gave us the use of his car, and that saved us a car rental. We hit all the sites including the harbor, the market and the Space Needle. Like I said, it was a once-in-a-lifetime experience (my wife despises that phrase)! They tell me that a NCAA semifinal game was played in the area that Saturday afternoon…darned if I can remember it. But that trip with Craig, John and Gary epitomizes what that ’89 season meant and STILL means to me. IT WAS A ONCE-IN-A-LIFETIME EXPERIENCE!!! 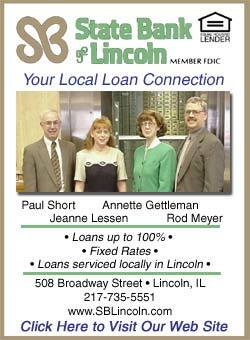 Part 1 – June 29, 2000 – "Joyous welcome and celebration for ’89 Flying Illini"
Click here to learn more about our great home mortgage rate special.